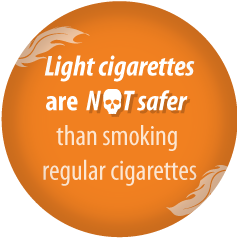 Despite all the marketing hype with lighter colors used in the packaging and official looking statements about tar and nicotine levels, the truth is light and regular cigarettes are virtually identical. Vent holes that are drilled into the filter can make you inhale smoke deeper into your lungs. The illusion of a light cigarette comes from nearly invisible vent holes that are drilled in the filter. Tear off the paper covering your filter tip and hold it up to the light. You should be able to see the tiny vent holes. More or bigger vents holes mean that you may take deeper puffs. Turning a "light" cigarette into a not-so-light cigarette. The vent holes can also get covered and clogged during smoking, so you inhale more cancer causing tar. Light cigarettes have more chemical additives! Cigarette makers often add extra chemicals to hide the harsh feel of the smoke. The lighter feel of the smoke makes it easier to inhale the dirty smoke deeper into the lungs. Call us: 1-877-500-2393 (TTY/TDD 711) or Request a Call - Call Hours: Mon-Fri 8 a.m. - 9 p.m., Sat 8 a.m.-7p.m. and Sun 9 a.m. - 5 p.m.